7.59 points at 29 votes (rank 179). Kennedy Approach simulates the work of flight controllers at their terminals on big, US-American airports. 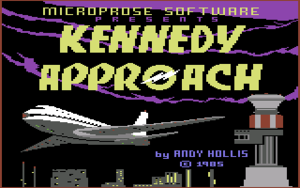 The title of the game is an allusion to the airport in New York,the JFK (John F. Kennedy Airport) and indicates the direction for the player. All on his own he fights against the constantly rising flood of flights that need to be checked and which quickly change from short national to international flights, enriched with emergency situations, storms which spread over the airport or machines with too little kerosene in the tank, which need to make a forced landing. 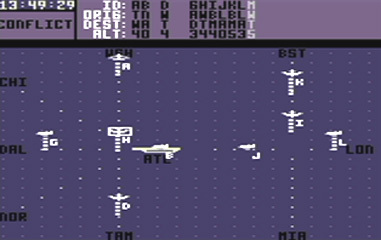 The game takes place on a simple dotted pattern, where the airplanes move. The dots depict the lights of the flight controllers' instructions and only at the grid points can the airplanes change their direction or height. Depending on the level there are one or more airports as working basis on the screen. A speciality of the game was the - for 1985 - great speech output, which repeated every control command in the best American English and told the player what it was he had commanded. At the beginning the game appears to be sedate. If you don't use an emulator with the possibility to raise the game speed, you could well go and make a coffee in the first level. But already in the third level the fun is over and you earnestly ask yourself, how secure our air space can be. At the beginning there are only one or two approach ways to one airport, but the number rises. While at the beginning only a dozen airplanes need to be dealt with, this number doubles quickly and special wishes as "6 Minutes Fuel!!!" and the faster flying Concorde raise the speed as you need to prioritise them. In this game you need to avoid conflicts - that means no more than granting the airplanes enough distance to each other. This is one grid dot for airplanes in different heights, and three dots for those on the same height. So you can let start four airplanes one after the other with one dot distance, when the first rises to 4.000 feet, the second to 3.000, the third to 2.000 and the last to 1.000. As long as there is a distance of one grid dot and 1.000 feet between them you are on the safe side. When having less than one grid dot distance, the minimum height distance must be 2.000 feet. But simple planning is over at level 3. Flights are displayed randomly. Here the flights, that need to be started from the airport differ from the ones that land and the transit flights, which only fly through but should land somewhere else. Additionally there are the private airplanes which just quickly want to do an aerodrome circuit. At the latest when six flashing airplanes (CONFLICT!!! 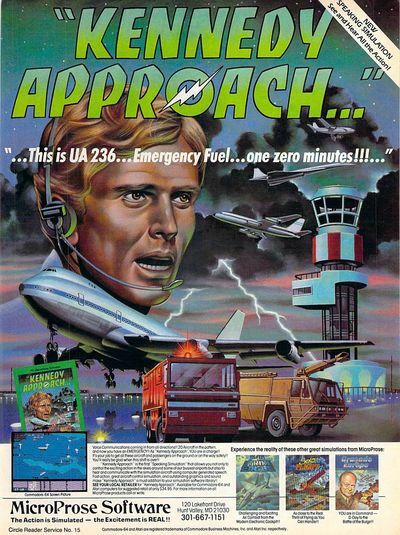 ), two emergencies "6 MINUTES FUEL!" and one Concorde are on the screen, you don't make any jokes any more about the simple graphics and the plain game principle. Now the 15 seconds distance between the grid points become a nightmare. If you mastered the New York shift with the highest skill, there are only more shifts in New York. Other airports cannot be chosen. Also, the (admittedly very high) difficulty grade does not rise any further. The number and clustering of new flights is lower with an additional thunderstorm as with a clear sky. Whether or not there is a thunderstorm is decided randomly. The game priniciple is simple. At every point of time the airplanes need to have a distance of 1.000 feet in height or at least three grid dots horizontally between them. Furthermore during the dispatch of flights which leave the field, you need to get the direction, height and of course the destiny right. The flights are sorted alphabetically, so they either can be chosen by keyboard or be "caught" by joystick through a frame, with which you move over the corresponding airplane, then you klick and you are able to steer it. It is essential to have a feeling for the order of the flights at every point of the game. If you have played the game a few times, you quickly notice the most common, fast ways on the screen (which of course differ from airport to airport). Wether these are straight, curved or round paths, comes to you only by experience. Leave transit flights, which do not go to the base airport, at 5.000 feet the whole time and only shortly before it leaves the field lower it to 4.000 feet. Set direct flights, which head straight for the base airport, forthright to 0 feet ("Cleared for landing"), when they are not in the way. Send leaving flights as far from each other as possible. If 4 flights should get dispatched (1 north, 1 south, 1 northwest, 1 southwest), then in this order: north, south, northwest, southwest. Send them all with one grid dot distance and 4.000-1.000 feet lowering. Set each onto 4.000 feet on time, when there is enough distance to the next airplane. Don't panic! 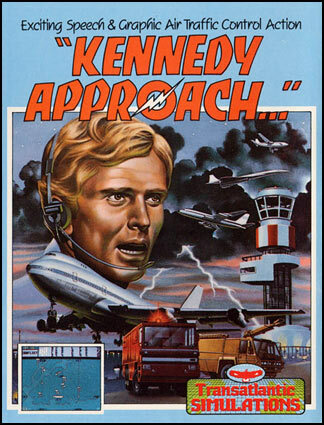 Hardly any other C64 game needs as much calmness and patience as Kennedy Approach. I mean what I say and that's the way it is. By keeping the "space" key pressed, the simulation speeds up. With this you can easily speed up idle time. To prompt the status of a machine (height and orientation) just keep the fire button pressed when choosing the machine. To abort a command also press the fire button for a longer time. This is especially handy when accidentally the wrong airplane was chosen or in shortage of time. To automatically let a machine circle in the air (waiting loop): pick the machine and keep the joystick pressed to the left or right until a circle symbol appears, then confirm by pressing fire. Then the machine circles in or against clockwise direction around the next radio tower. The machines should be chosen directly with the keyboard and the corresponding letter. The alternative selection with the slow selection box is unnecessarily time intensive. The game rather forgives delays in flights than conflicts. If you can choose you should let machines wait on the ground instead of sending them into an already overfilled region. Macrobee: I've rarely had so much fun with such a simple game principle. 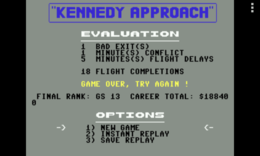 Only Donkey Kong or PacMan could reach to Kennedy Approach. The sonorous voice of the tower clerk decides about heart frequency 80 or 180. I can only recommend this game, when you are in the mood for three hours of private fun. I give here at least 9 points (at the moment I don't have any overview about what might get 10 points). Triton: Absolutely timeless! The simplistic game principle ties to the screen still today. The simplistic graphics is absolutely negligible - there is still reason for an adrenalin push. The harshly rising grade of difficulty sees to some extra shift as flight controller. Only one small critical point from my side: the up-diagonal perspective causes closely flying airplanes to overlap vertically (understand?). Nevertheless 9 out of 10. Rockford: At that time I started playing it, I didn't get it and never touched it again. Today I know that you need to wait for about two minutes until the first airplane arrives... In any case is has something ruminant, the speech output is really great and it could well tie me for some time. For the vote I will wait until I can control the game a bit better. Ok, now I got a little practice... just forget the silly sentence "it has something ruminant"... Starting from the third airport I feel inclined to sit in front of the screen with upper shirt button opened, sweating and chain smoking. A tic of luck is of course involved, it depends on the way the airplanes arrive, but without any worries I can give 8 points." Hartmut: "I've hardly played any game as often as this one, on C64 as on emulator. But I have to admit that the record would be possible on the C64 (without warp-mode). Of course I give 10 points for the game and refer all the interested people to the homepage www.KennedyApproach.com (l9ink: see below)!" Klaws: "When I had seen the game for the first time in these days, I only wanted to have it due to the (at that time spectacular) speech output. But when I then actually had it, the speech output quickly took a back seat: the high-grade addictive game concept had grabbed me! Absolutely recommendable!" Vitus: "The game is unbelievably gripping and challenging. At one moment you have everything under control, then 2 new airplanes appear in an already overcrowded area and the chaos starts. On the highest skill it is easier to play with a thunderstorm imho, as not so many flights need to be managed. Although the game might look complicated at first, it is easy to learn and should be tried by every C64 fan. The graphics are not nice, but functional. My all-time-favourite - 10 points. - Edit: The Windows Remake also runs well with Wine under Linux." Midas069: "For me the day is just not perfect if I have not played a round of KA. Trying to avoid all conflicts for 20 minutes at the highest level, is again and again a challenge. And, yes sometimes I can make it. What do you need complex graphics for? This game prooves that also simply made games can be the absolute high. Full 10 points from me." lieverhein: "The ideal game for letting your brain work on work problems (modeling) in the background. Raonoke is nearly impossible at the highest level, but I usually manage it after 3 or 4 failures. I always work my way down the list of airfields, I just skip the old Hong Kong version (version II is difficult as it is!). I was hooked while it was on the C64 of my brother-in-law (before marriage, 1984 or so) and was so happy to find it on the web. I played 888 career sessions from 12-3-2010 to 10-4-2019 and I lost my career files from before that time. I would love to program new airfields. Does anyone have the code to this?" This page was last modified on 14 April 2019, at 15:35.